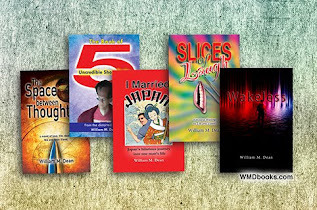 William M Dean - Slices of Laugh: Wet-y Larceny: How to Steal Your Neighbor's Water! 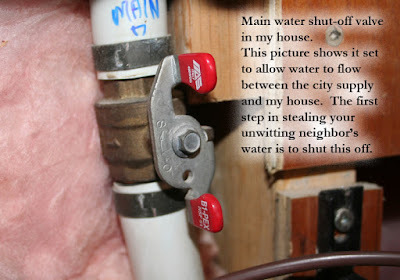 Wet-y Larceny: How to Steal Your Neighbor's Water! On what was surely headed toward to being one of the worst Friday mornings ever, I cleverly turned the tables and realized a dream of more than 20 years. Before you read further, you need to know that I dream small and am known to be cavalier with my use of the word "clever." It all started at 2:30 am when I got up to go to the bathroom. I turned on the tap to wash my hands and no water came out. Suddenly wide awake and frozen, with my hands well greased in soft-soap, I could hear the shallow hissing of air from the faucet and realized that this is the sound you get as water falls away from the tap. "Well, that's not good," I surmised. 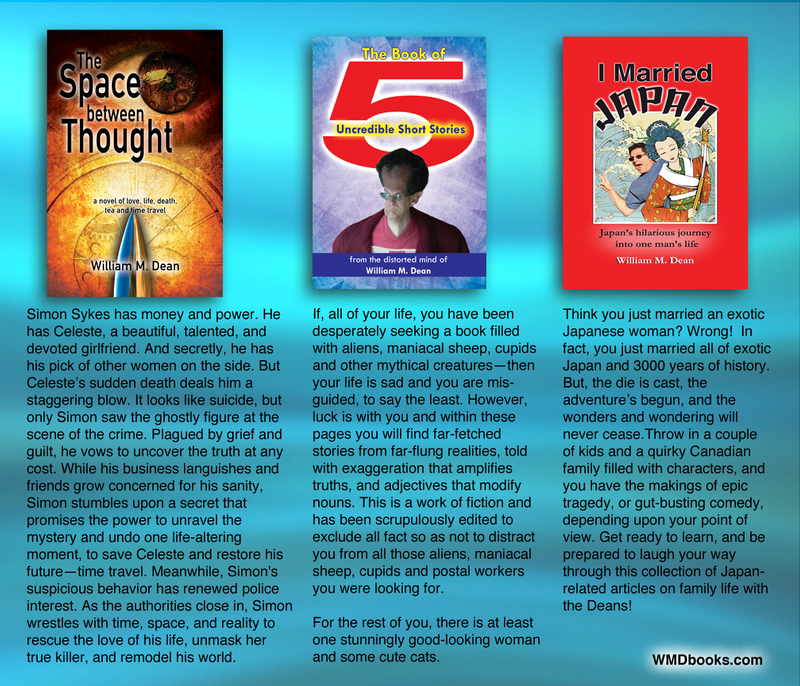 We'd recently had some problems with our hot water heating system, so I proceeded from tap to tap, testing, hoping for some other explanation, putting off the inevitable—checking the furnace room. When I got there, however, I was happy to see that all looked well. The system was not leaking, but, of course it was off and the pipes were cold. We have a gas boiler which delivers in-floor hot water heat, on demand. So in our house, no water equals no heat. But because our system heats the cement slab, it takes more than a day for the temperature to drop noticeably. Next I went to the windows. They didn't have any water, either. When I looked outside I assumed that it had rained because the street was wet. But then I noticed that the sidewalk was dry. I put on some shoes and ventured out. The road was covered in wet sand which, in some places, had rippled into small dunes, like miniature beaches. Our area is made up of clay dirt. Sand is not natural, so I realized that the water main must have broken. Water pipes are buried in a trench, filled with sand and the gushing water had carried it to the surface. The entire block was wet, but there were no rivers, so I guessed that the city had already been alerted and shut it off. I went back to bed, but was restless knowing that in a few hours, the five adults and two kids in our house would all need to use the toilets, brush their teeth and get off to school/work. Our new tenants had already been inconvenienced, earlier in the month, when our hot water unit suddenly died. We were three days without hot water and I felt that having patiently put up with that, they would not appreciate being further tested. Then I remembered! And I realized that I had been prepared for this, for more than 20 years. This was The Moment!—the instant when I could make use of a random thought that had occurred to me way back, in the early nineties. The thought was that if I shut off the valve to the city water supply (the valve inside my house), I could then refill my house water from a neighbor's house! 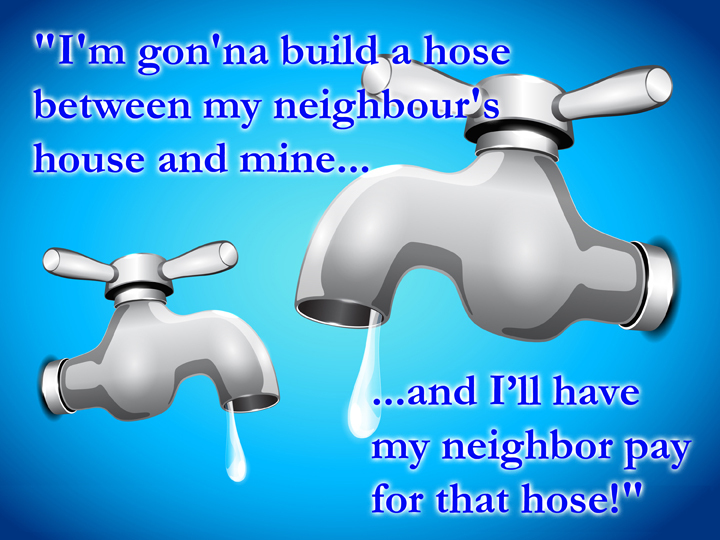 Our backyard-neighbors all live on a different street, unaffected by our street's broken water main and all I'd have to do is somehow connect a hose from their outside tap to one of mine, open both faucets and let their water enter my house and fill our pipes. In fact, ten years ago, I had saved an old washer hookup hose for this exact purpose. I didn't want to wake everyone up by skulking around at three am, so I forced myself back to sleep. At seven thirty, I got started. 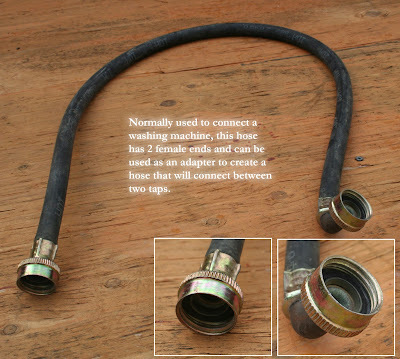 For this to work, I would need about 50 feet of hose and some sort of adapter so that both ends would be female and attach to the outside faucets of both houses. That was what the washer-hose was for. My first problem was finding that hose because it wasn't where I expected it would be. After twenty minutes of searching I gave up and decided I might somehow be able to splice together two old hoses. 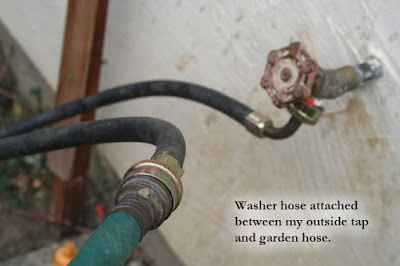 Shortly after butchering two hoses, I stumbled upon the washer-hose. This is my life. If I was in bomb disposal, I would discover that the instruction after "Cut the red wire" would be "But before you do that..."
I shut off the water inside my house. 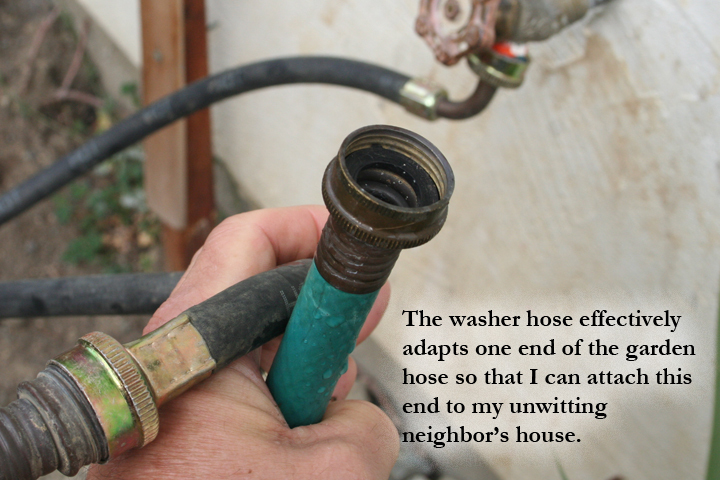 Then I attached the washer-hose to my outside faucet, attached a 50-foot hose to that, and hopped the fence to my neighbor's house. For an outside observer, it probably did not look so much like a hop as a hobble—it was certainly not the "hop" of my twenties—but there were no outside observers, and this is my story to tell. 2) they were getting ready for work, in which case I would talk to them and get permission. 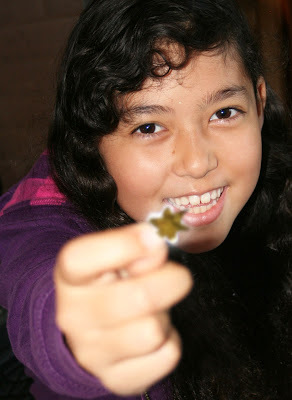 Hopefully, they would see that if they helped me now, I would be able to similarly help them in the future. If not, I'd head to the next neighbor's house. As it turned out, there was a third possibility that I neglected to consider. ME: "Uh... Hi! I'm Bill, your neighbor, from behind, on Lancaster Street. 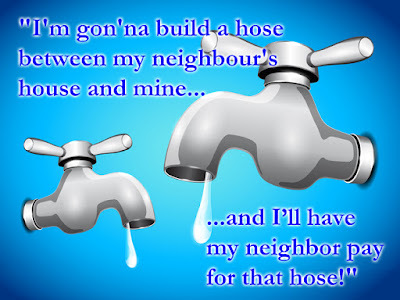 Uh - our water main broke and I was wondering if I could attach a hose to your outside tap and get some water from there..."
PARANOID BABYSITTER: "Ummm... the home owner is not in, right now. I'm not sure they'd be ok with this. Sorry." I said, "No problem. Thanks." trying my best not to make that last word sound sarcastic. There was only one other neighbor within reach of my hose and, lights on or not, I chose to just attach the hose and leave a note rather than risk another negative response. They have a dog, so I crept very cautiously into their back yard, attached my hose and slowly turned their squeaky faucet. No barking. The dog is old and now, I'm guessing, deaf. Excited by my illicit activities as well as the prospect of seeing my ingenious plan in action, I hopped back over the fence, ran to my own faucet and opened the valve. This startled me. I went back over the theory. By now, people were starting to wake and I was running out of time. Deflated, I texted my tenants that we had no water and headed back outside to take everything apart. As I was pulling the hose back from my neighbor's yard I noticed an unusually tight kink in one of the hoses. When I straightened it out and reconnected, I could hear the water rushing through. Back into the house and Voila! Water for everyone. Since the boiler system was also replenished and we have on-demand hot water, we even had hot water. Magically, my house was now the only one on the street with running water. I was tempted to go out and water the lawn so that everyone would know. My neighbors would certainly have been startled, but mainly because I never water my lawn. Instead, I texted the tenants with the good news, and left the system in place until everyone was out of the house. Then, while detaching my hose, I bumped into my neighbor who told me that he was happy to have helped and thought my fix was surprisingly clever, which I chose to take as a compliment. In all the years since this solution first occurred to me, you might wonder why I never asked a plumber about it. Well, first of all, it just never came up. But secondly, I was afraid they might tell me that this is an old and well-known hack, from way back... that it's common knowledge to plumbers. It was my original thought and, I believed, an inspired leap. I didn't want the outcome handed to me; I wanted to find out on my own. This is so "me," and it's why I never read any of those self-help books everyone keeps giving me. I'd so much rather puzzle things out on my own, even if I have to stumble through disaster to get there. For some reason, "owning" the solution gives me a deep satisfaction. This is one of those rare occasions when my inspiration actually paid off and I was ecstatic. It is also one of those moments when, unable to contain my enthusiasm, I recounted my adventure to my wife and kids and received ungratifyingly blank stares in return. "Should I get you a gold star, Daddy?" said my nine-year old daughter, who suddenly seems to have mastered sarcasm. They are completely unimpressed because they don't know, or care, about plumbing, and can't appreciate the leap of genius that had to happen in order to think the original thought, or the dedication required to allot space in my brain for 20 years, or the foresight involved in saving a piece of hose for ten years, or the good fortune in being able to find that hose when it was needed. They don't know that this solution would never occur to the average home owner. And they don't understand how a genius-type-thought of this magnitude can make up for so many gap-moments: Like that time when you suddenly forget your best buddy's name, or when you walk into a room and can't remember why you went there, or when you put the cat in the freezer, or forget the baby in the car seat in the parking lot at the hardware store. This makes up for all of that! I wish I had watered the lawn. Thanks for reading my article, but please don't steal my water.